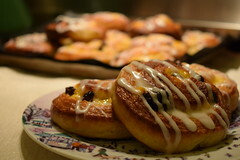 I love pastries, especially croissants and pain aux raisin. 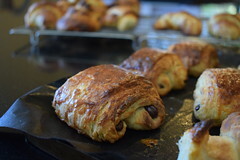 Mind you the last time I did a course with Richard Bertinet, I had the most amazing almond croissant. And for someone who really doesn’t eat nuts, it’s quite an achievement to find something with that has nuts in it that I’ll quite happily walk through hot coals for. However the homemade variety of any of the above are labour intensive. A true labour of love. So I’ve tried to come up with a variation that doesn’t stray too far from the true path of viennoise. And yes, it takes time, but is not work intensive. Are they as good as Richards? No. But then I’ve had croissants from the depth of France that aren’t as good as his. It’s all about balance. Mix the flour, salt and sugar in a mixer bowl. Warm the milk to a little under blood temperature and add the yeast. Leave to “sponge” for 5 minutes. 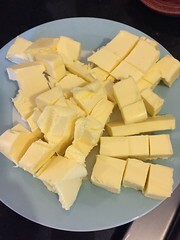 It looks like a huge amount of butter, I know! 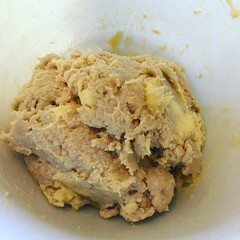 Add the milk/ yeast to the flour and mix on low speed until it looks almost like a bad cookie dough. Add the cubed cold butter in three goes, mixing slowly each time. When the butter cubes look evenly spaced through the dough, cover and leave in the fridge for a few hours. Remove from the fridge and gently start to bash the dough into a square with a flour duster rolling pin. Then roll out to a large rectangle. Working quickly, fold the outer edges in to touch, a little like a book. Give the dough a quarter turn and roll out again, repeating the folding and turning once more. Keep your work surface well dusted with flour and also remember not to turn the dough over. Just keep in sliding! Fold again like a book, wrap in clingfilm and leave overnight in the fridge. Next day roll out the dough as thin as you can on your floured surface. Using a very sharp knife, cut triangles out of strips. Roll up as demonstrated in the video clip. Brush with egg wash (the egg yolk and milk, mixed well). Leave to rise for about 1 1/5 hours before baking in a preheated 200oC oven for about 12 minutes. Enjoy with some strawberry jam and a hot cup of coffee. Or make the dough into pain aux raisin. Double Divine. There’s nothing like a leg of lamb, roasted with garlic and rosemary. For my practical exam at the end of my Ballymaloe Course I cooked a leg of lamb with cumin, and it really was delicious, even if the leg itself was so big it threw my timings a little. But it was so tender and full of flavour. When you buy Irish lamb, you can be almost guaranteed that it has been raised in the near organic conditions of Ireland farming landscape. Sheepmeat production in Ireland remains largely a traditional farming activity, where small holdings are carefully tended by farmers with a proud tradition of excellence in food production. And this is the way it should be. While eating in Ballymaloe House with my father in law, and my eldest, we saw Hogget was on the menu. This is lamb from the previous season, so it is between 12 and 18 months old, and not yet mutton. Hogget is often a much better buy due to the size of the animal at this age, and also the developed flavours in the meat. It is also not as fatty as mutton, and therefore can be substituted easily for lamb. It has hugely benefited from roaming freely for the extra few months, chomping on heathers, and brackens, and developing better muscle, to give a finer grain to the meat. Ireland, in particular, has a history of sheepmeat in the diet. But historically the meat was only used if the animal was old, or had died. In a land where sheep were often the primary meat food source, it is not surprising that it became the basis of many traditional dishes like shepherds pie, or the Kerry pie, that was traditionally served at the puck fair in Killorgan, often this type of pie was called a fairing. Myrtle Allen had investigated this pie over 40 years ago, when she first came across it. Twice on the hips. Or so they say. And never more true then with pastry I think. But I really love pastry, in all it’s guises, be it a mince pie at Christmas, or the golden brown covering to a chicken pie. This week we took a leap forward in pastry making to Flaky Pastry. There are multiple stages to making flaky pastry (all of which involve lots of butter), but each stage involves only a few minutes actual hands on, then lots of fridge time for the pastry. So we rolled and squared our sides, and rolled and squared our sides, and added butter… you get the gist. Then a final overnight in the fridge. That was yesterday. Today was pie and stew day, so oxtail, beef and oyster, and my task, Italian Beef stew were all on the menu. 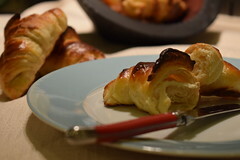 And apples tarts for desserts, so lots of opportunity to use the aforemade flaky. And because I like being a little retro, and because it is truly YUM, I asked my incredibly patient teacher would it be possible to make mille feuille. With only the slightest of eye rolls (I jest, she was as enthusiastic as I was! ), we embarked on the road to pastry pinnacles.